Though we call them late 2013 Mac Pros, it took us until March of this year to receive our new entry-level Mac Pro. Apple released the redesigned Mac Pro near the end of last December, but high demand quickly pushed the systems’ estimated ship date to February 2014 and beyond. At $2999, the least-expensive Mac Pro features a single quad-core Intel Xeon E5 processor running at 3.7GHz, 256GB of PCIe connected flash storage, 12GB of RAM, and dual AMD D500 graphics with 2GB of VRAM each. We also recently reviewed the $3999 high-end stock Mac Pro that ships with a single 6-core Intel Xeon processor running at 3.5GHz, 256GB of flash storage, 16GB of RAM, and dual AMD D500 graphics with 3GB of video RAM each. While Apple offers two stock configurations, the new Mac Pro is really meant to be customized at the time of purchase. It has the same amount of internal flash storage as a laptop and no available PCI slots for expansion cards. 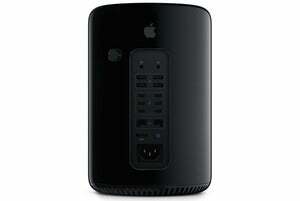 The Mac Pro relies on six Thunderbolt 2 ports and four USB 3.0 ports for additional storage and other devices. The new Mac Pro also comes with dual gigabit ethernet ports and 802.11ac wireless networking. Our review of the 3.0GHz 8-core Mac Pro has the details on the design, features, and usability of the Mac Pro. Compared to the previous entry-level Mac Pro, a mid-2012 model with a quad-core Intel Xeon running at 3.2GHz, a 1TB hard drive, 6GB of RAM, and an ATI Radeon HD 5770 video card with 1GB of video RAM, the late 2013 Mac Pro was 77 percent faster, overall. The new Mac Pro was faster across the board, but graphics tests really stood out, with frame rates in the high-resolution Heaven and Valley benchmark 10 times as high as the 2012 Mac Pro. The PCIe-connected flash storage was able to copy 6GB of data in less than 25 seconds, while the old Mac Pro took two minutes and 27 seconds. MathematicaMark was 55 percent faster, iPhoto was 34 percent faster, and the PCMark Office suite score on a Parallels Windows 8 virtual machine was 78 percent as high as the 2012 Mac Pro. It should come as no surprise that the entry-level Mac Pro didn’t perform as well as the high-end $3999 stock Mac Pro, which was 11 percent faster overall. Despite the double-digit performance differences, many of the results were nearly identical between the two stock Mac Pros: iTunes import, file copy, zip, unzip, and PCMark Office tests were all within one percent between the two systems. The 6-core system was much faster at tests that could take advantage of the additional processing cores; HandBrake was 23 percent faster than on the quad-core Mac Pro, Cinebench CPU test was 30 percent faster, and MathematicaMark was 36 percent faster. As we’ve said before, for many casual tasks, an iMac might perform better than a Mac Pro. Our 2013 CTO 27-inch iMac with quad core 3.5GHz quad-core Core i7 processor, 3TB Fusion Drive, and Nvidia GeForce GTX 780M graphics posted a 12 percent higher Speedmark 9 score than the new entry-level Mac Pro. The biggest difference was in the iMovie test—Intel’s Core i7 processors support quick sync video anbd Xeon processors do not. A task that took the iMac 47 seconds to complete took 3 minutes and 48 seconds on our new Mac Pro. For pros that use apps that take advantage of multiple processing cores, the Mac Pro is a time-saver, but is probably overkill for everyday tasks. The $2999 Mac Pro is a real step up from its predecessor.